Both posts don’t reference any database version although the “Oracle Developer Advocates for SQL” hints the following error, which only happens on database versions higher than 12.1, when the PGA_AGGREGATE_LIMIT parameter was introduced. Martin mentioned Adrian Billington‘s post regarding similar tests. I used Martin’s mentioned wall clock TIMER package downloadable via his site, because I had to use SQL*Developer. The scripts shown were run multiple times before taking down the results noted here. The two different version, to see the impact/improvements made by the XMLDB developer team regarding introducing a more optimized XQuery Virtual Machine (XVM) implementation. Officially performance improvements were announced for Oracle 12.1, like XMLTYPE “parallel” support and the additional XMLTABLE “returning sequence by ref” feature, but probably already implemented in 11.2.0.4 (at least Marc noticed behavior changes – I still couldn’t test on 11.2.0.4). Be aware while looking at the results below, they represent XMLTYPE handling in memory (XVM section), so without any reference to storage. If storage would come into play, (huge) differences regarding additional performance optimizations would become also possible for XMLTYPE content. 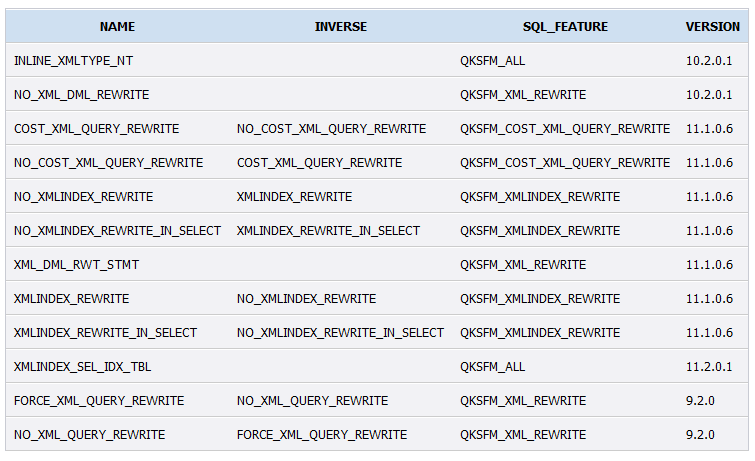 Also I tested with the NO_XML_QUERY_REWRITE SQL hint, to see if and/or how it would effect performance. As mentioned, NO_XML_QUERY_REWRITE forces a different (functional evaluation) optimization method. I went for the 1.000.000 as mentioned in Oracle Developer Advocates for SQL. As you can see I also added Adrian’s “CONNECT BY ROWNUM” initial example, to have a little bit extra cross reference output. -- bug in 12.1.0.2 - socket connection lost ? So 11.2.0.3 must be horrible then…? Again I went for the 1.000.000 as mentioned in Oracle Developer Advocates for SQL. The script I used on database version 11.2.0.3 (PGA=500MB/SGA=1GB) was the same, but the CUBE solution, out of the comparison with the 12.1.0.2 test due to its socket error (bug? ), wasn’t used in this setup. I couldn’t find a difference (yet, still might have to dive deeper) why the CONNECT BY LEVEL or CONNECT BY ROWNUM where definitively faster on 11.2.0.3 than on 12.1.0.2. I had no PGA issues (like described by Tanel) on my environments, database parameters as far as I can see, are behavior identical. Both database versions show exactly the same explain plans for the two, like the following. A database event setting like 10053 might shed some light on the differences between the two database versions. The COLLECTION ITERATOR PICKLER FETCH (XQSEQUENCEFROMXMLTYPE), an in memory operation, is typically a sign that the operation is solved by general XML Parser means, that is, no Oracle side (mostly storage) optimization is in effect. There are multiple XML related hints you could use in 12.1. Using the query transformation hint NO_XML_QUERY_REWRITE in Oracle 12.1 decreases the performance. 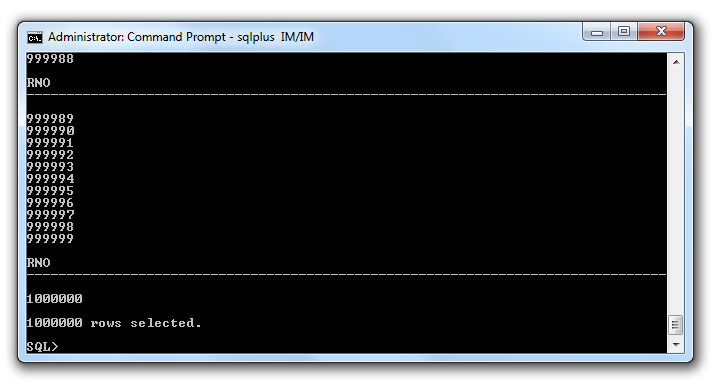 The NO_XML_QUERY_REWRITE hint instructs the optimizer to prohibit the rewriting of XPath expressions in SQL statements. By prohibiting the rewriting of XPath expressions, this hint also prohibits the use of any XMLIndexes for the current query. So from the XVM / XML DB standpoint, what is the effect from using this HINT in our current used statement? Apparently this will we passed on the SQL Optimizer. SELECT SYS_XQSEQ2CON(VALUE(KOKBF$0)) "RNO" FROM TABLE("SYS". "XQSEQUENCE"(SYS_XQ_NRNG(1,1000000))) "KOKBF$0"
SELECT SYS_XQSEQ2CON("P". "C_00$") "RNO" FROM XMLTABLE(/*XMLTAB_RWS*/ '1 to 1000000' PASSING '1 to 1000000' COLUMNS "C_00$" XMLTYPE PATH '.') "P"
Finally the rewritten statements are different. Final query after transformations: ******* UNPARSED QUERY IS ******* SELECT SYS_XQSEQ2CON(VALUE(KOKBF$0)) "RNO" FROM TABLE("SYS". "XQSEQUENCE"(SYS_XQ_NRNG(1,1000000)) ) "KOKBF$0"
Final query after transformations: ******* UNPARSED QUERY IS ******* SELECT SYS_XQSEQ2CON("P". "C_00$") "RNO" FROM XMLTABLE(/*XMLTAB_RWS*/ '1 to 1000000' PASSING '1 to 1000000' COLUMNS "C_00$" XMLTYPE PATH '.') "P"
I think one can safely state that a “1…1.000.000” number generation via a XMLTABLE statement does not take more than 1 hour to complete. I am guessing that people waited the statement to complete in, for example, Windows command window (CMD), and yes that will take a while before all content has scrolled through your command window…mine indeed, continued show scrolling figures for more than an hour. Depending on the database version, the method based on XMLTABLE should take 1 up to 2 minutes time. I wouldn’t have expected the database performance difference behavior for the “CONNECT BY” methods. Maybe if I have more time, I deep dive into that phenomena as well. Crossing the bridges and aligning between the SQL/Relational CBO realm and the XML/DB XVM realm in the database is more complex than one would expect. Also much is documented “internal only” and not easy to deduct in respects of the “what is going on here”. 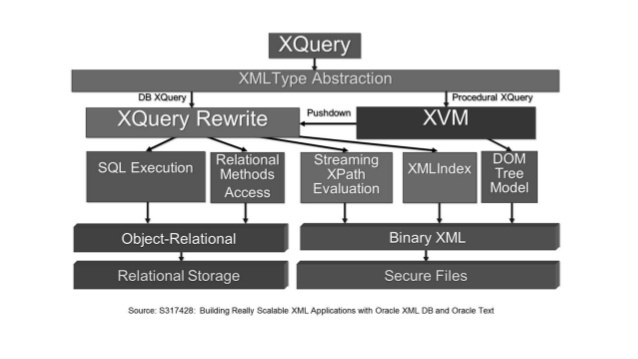 A lot of type and conversion functions and methods in the XML XQuery Virtual Machine framework is not documented and makes it therefore very difficult to understand. One “rule of thumb”, at least, goes up in this context. Do not use HINTS if you are not absolutely sure it is necessary for that particular situation and for that particular database version. The used NO_XML_QUERY_REWRITE hint had a performance negative effect for this example and apparently is regarding is documentation not on par anymore (“By prohibiting the rewriting of XPath expressions, this hint also prohibits the use of any XMLIndexes for the current query“). Apparently the “XMLINDEX_REWRITE” CBO hint is set by default and I can imagine that there are situations where NO_XML_QUERY_REWRITE alone is just not adequate enough avoiding also XMLIndexes. As you said, the test case posted on https://blogs.oracle.com/sql/entry/row_generators_part_2 is not relevant at all (no db version, no settings whatsoever). Besides, XMLTABLE is not used correctly for this task since, by omitting the COLUMNS clause, we force returning each row as an XMLType, which causes much overhead. We get much better results by defining the projection as a NUMBER. I almost missed your article (having reached a remarkable delay in my blog reading) – but I am very glad that my notice provoked your thorough analysis of the behaviour: I think you answer some of the questions from the initial post in the Oracle Developer Advocates for SQL blog (and raise some others). At this point I have to admit that I did not even try to verify the timing information from Natalka Roshak’s investigation: I guess I stopped the execution of the the XML operation after less than a minute – and labeled it “too slow for this purpose”. The windows cmd explanation of the extreme results sounds plausible (Jonathan Lewis already mentioned the arraysize (and roundtrips) as one major factor in the timing); for quick and dirty test I use autotrace with the traceonly option to avoid this kind of client representation problems. P.S. : by the way: whenever I am confronted with questions containing the words Oracle and XML at first I take a look at your blog.